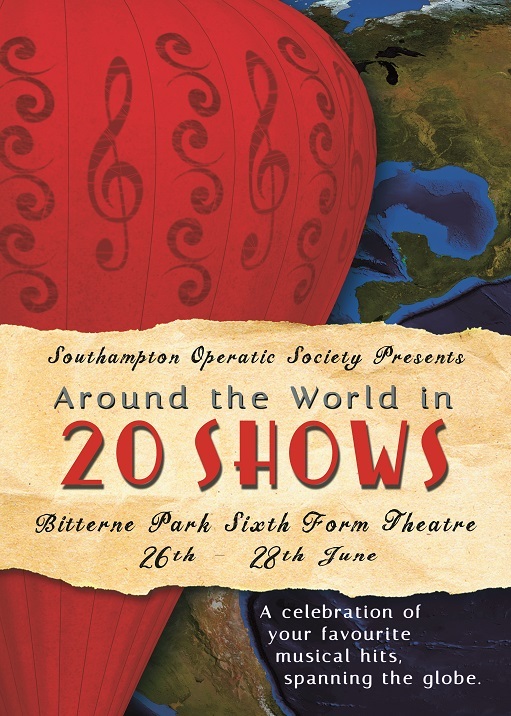 Albie Minns became the latest Masker to try his hand at directing a SOS show, initially he had been asked to consider The Magic Flute but declined and he suggested a G&S instead – an offer which was readily accepted. Philip Johnson joined him as MD and this would be the 16th and, sadly, the last time that he filled that position. 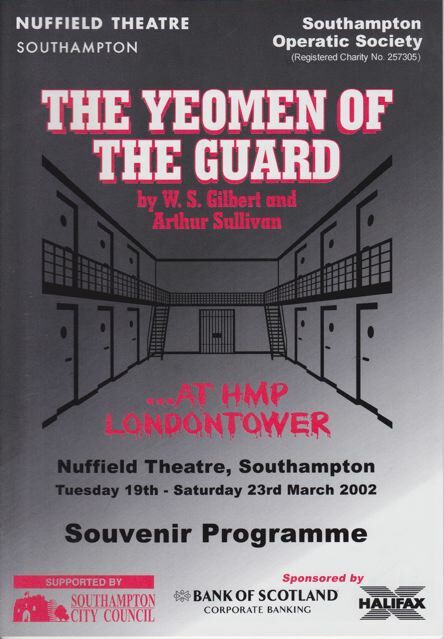 The Yeomen of the Guard is set firmly in Elizabethian England, even the dialogue is of the era, so Albie’s decision to update it to a typical HM prison in the 1920s (complete with a daunting background of rows of cells and an overhead walkway), was quite surprising – but it definitely worked. 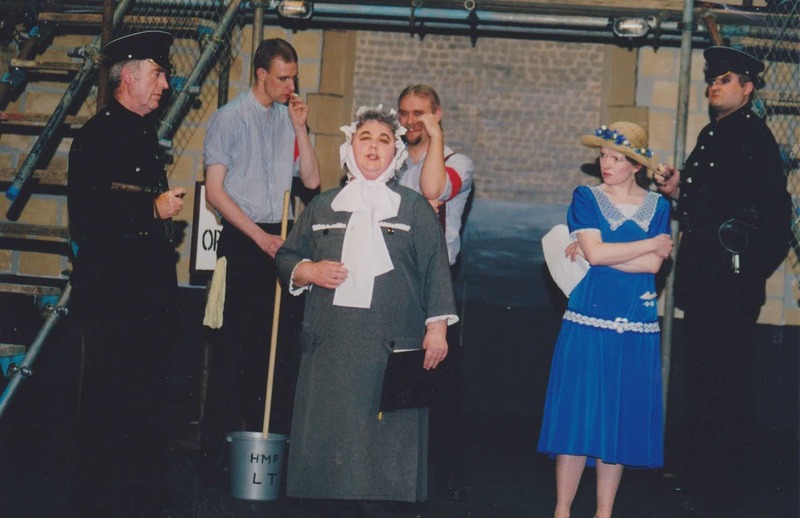 The ‘old lags’ became a feature of the action to such an extent that ‘trusties’ Adam Case and Phil Cheesman even swept confetti from the stage after the curtain call, much to the approval of the audience. Albie’s vision of Jack Point was interesting. 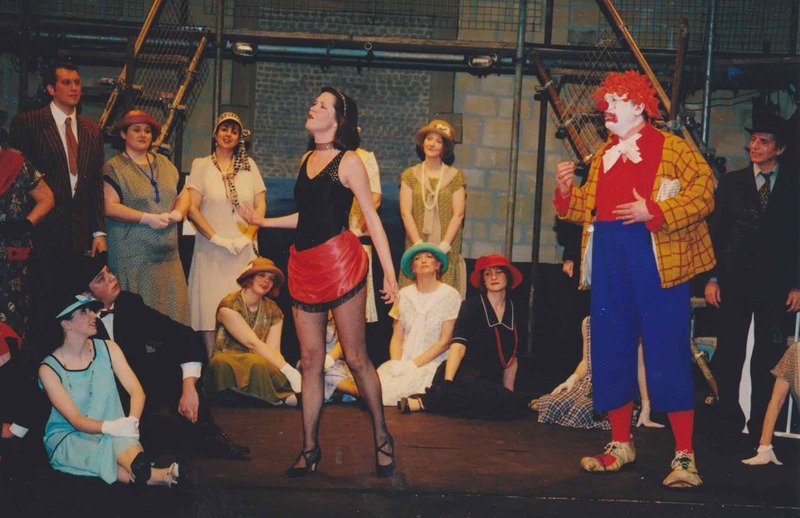 In his first scene David Rayner was dressed in full clown costume and later on appeared as a comedian straight from the Music Halls – similar to Max Miller, but with a variety of conjuring tricks. 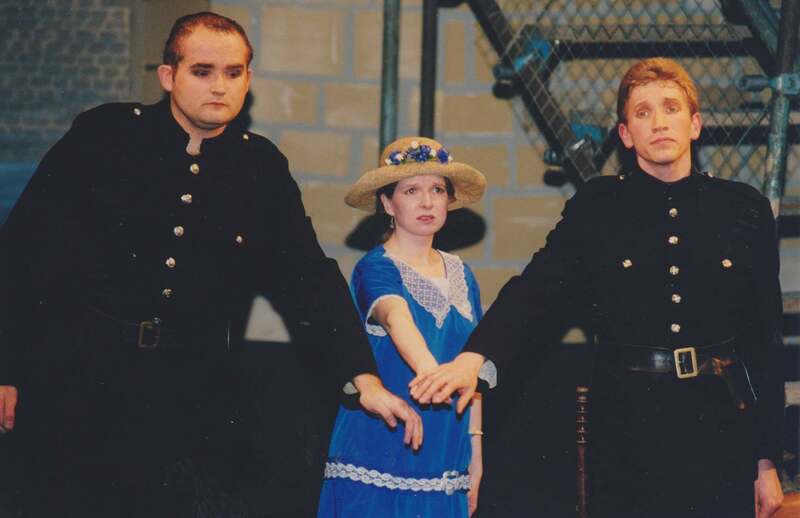 G&S enthusiasts often argue about the ending of the show as it is unclear whether Jack Point merely faints or actually dies of a broken heart. 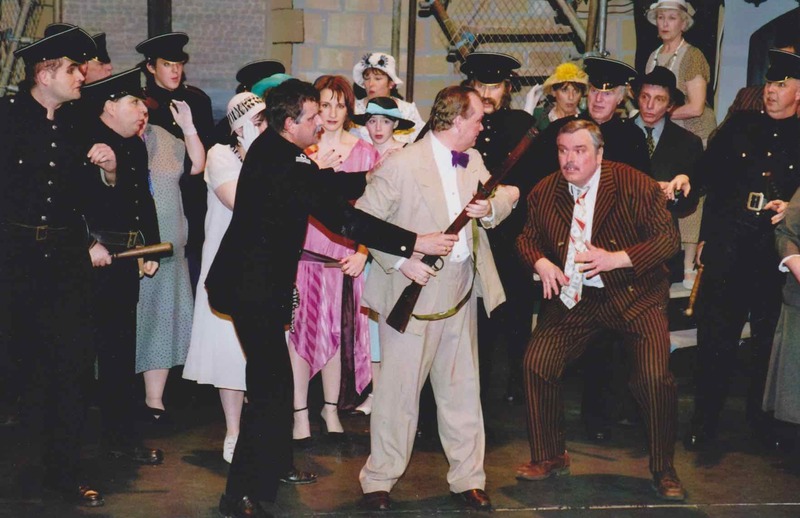 In this production they were left under no illusions since Jack seized a rifle and rushed off stage, the Act 2 Finale ended with the sound of gun-shot and a black out. 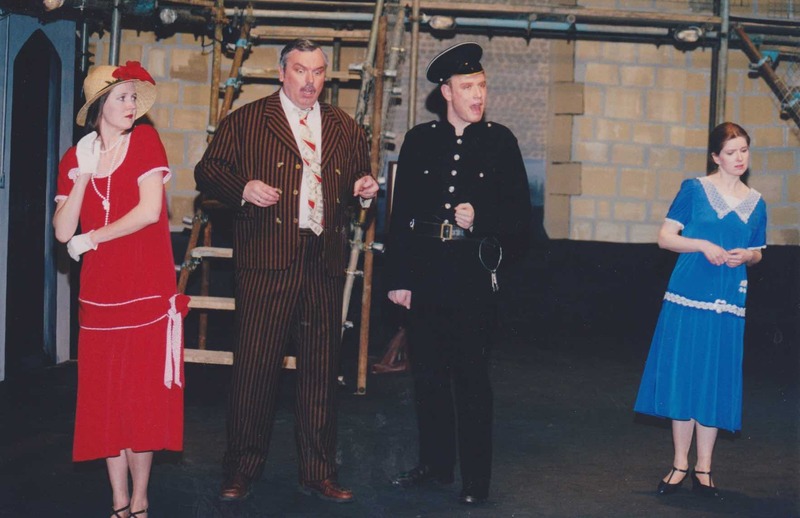 Although the portrayals of Sergeant Meryll (Mike Pavitt) and Dame Carruthers (Sandra Pettyfer) were reasonably traditional, other characters received a make-over; Wilfred Shadbolt (Paul Webb) became a ‘spiv’ and Sir Richard Cholmondeley (Alan Morgan) was a womaniser who seemed to be having an affair with his secretary. 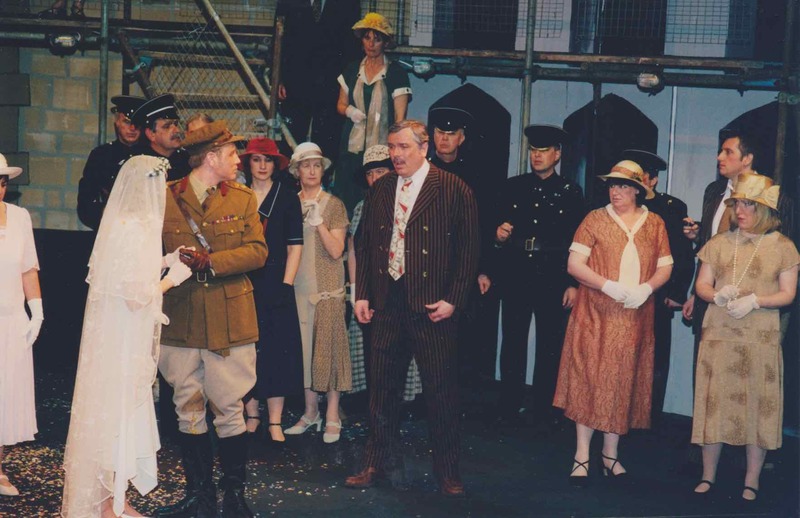 The Echo review was very appreciative of the production: ‘This unconventional treatment of one of Gilbert and Sullivan’s darkest works places the action in the post-First World War period. Producer, stage designer and adapter Albie Minns uses black uniforms and a prison setting to emphasise the sombre elements, yet still succeeds in retaining the humour. Also retained are the twists of the convoluted plot: an innocent prisoner facing the death penalty marries a blindfolded bride. He later escapes, to her consternation. A prevaricated shooting later and they are happily reunited, unaware of the grief this causes to others. Ticket sales were, perhaps, on the low side for the time of year but sponsorship had been acquired from the Bank of Scotland and the Halifax plus it was not necessary to hire Yeomen outfits, resulting in the production showing a profit of £911.